•Closed polylines are hard to spot as they often appear to be short tributaries. They are only obvious when overlaid with the node layer and you see a polyline which does not have a node at one end. •In the image below, nodes are indicated by large light green dots. As you can see there is no node at the downstream end of the selected polyline which means it's downstream node has snapped to the upstream node thus closing the polyline (red cross). 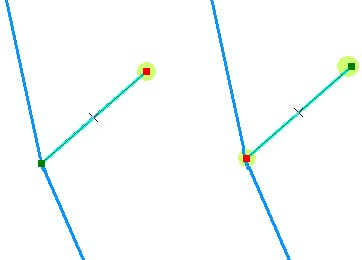 Although this polyline intersects the rest of the network it does not participate in the topology of the network. •To correct this, the downstream node has been deleted and second vertex now becomes the downstream node of the polyline (green tick). •The main stream polyline needs to be split at the red downstream vertex and polylines snapped to a new node.